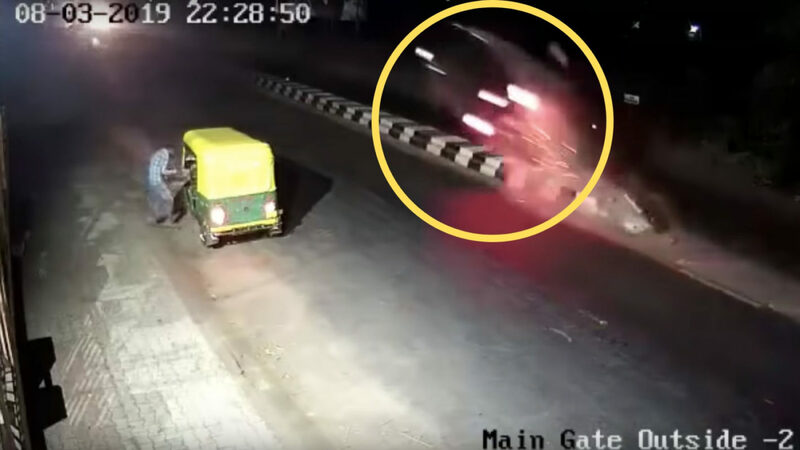 Here is a video from Anand, Gujarat that shows a car catching fire soon after hitting the divider. The reason for the accident is that the driver couldn’t notice an unmarked divider and collided with it at a pretty high speed. The car rolled over multiple times and caught fire. Unfortunately, the driver died on the spot. The video doesn’t clearly show the make and model of the ill-fated car. However, what’s clearly shown is that the driver clearly missed the divider and went straight over it. Also, careful observation shows some sparks flying as soon as the car hits the divider. As it could have been a case of the car being unable to automatically cut off the fuel supply, the sparks caused by the high friction seem to have resulted in a fire. While details aren’t available at the moment, it is being said that the driver couldn’t leave the car on time and unfortunately died due to the fire. Chances are that the multiple rollovers that were caused by the crash would have rendered the guy unconscious or injured, therefore limiting his ability to react quickly and get off the car. Another possibility is that the rollovers would have jammed the door and the driver couldn’t escape due to this. This incident clearly highlights the danger posed by both overspeeding and unmindful construction of unmarked dividers. The accident could have been avoided had the guy wasn’t going too fast. Plus, a bold reflector or a warning light at the starting point of the media could have alerted the driver. The fact that the car was going quite fast and the absence of any kind of streetlight or warning light led to the divider going entirely unnoticed by the driver. We are very sad to hear about the loss of life. We are also upset about the casual attitude of the authorities and the tendency of many drivers to overspeed in visibility. While we would hope that the authorities would take notice of such mishaps and put a warning light or sign on all such medians, we request all our readers to avoid going too fast.